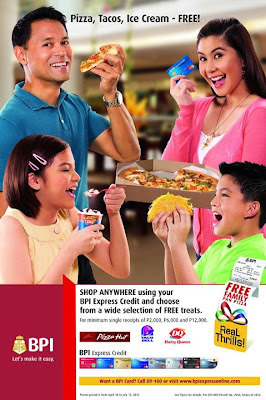 BPI Pizza, Tacos & Ice Cream ~ Philippine Freebies, Promos, Contests and MORE! BPI is giving their cardholders another reason to enjoy spending. Enjoy FREE Pizza, Tacos & Ice Cream every time you shop using your BPI Express Credit card. For every P2,000, P6,000, or P12,000 spent anywhere, you get to choose from a wide selection of FREE treats from Pizza Hut, Dairy Queen and Taco Bell. You can redeem one (1) FREE food item per qualified charge slip and make up to three (3) redemptions per day, per store only.